Inclusive teaching gets a lot of attention on college campuses. Instructors are increasingly expected to understand how course climate— the intellectual, social, emotional, and physical environment of a class—impacts their students, and respond to calls for inclusive classroom environments from both students and administrators.1 But creating a supportive learning environment for all students can be challenging. Where do you begin? 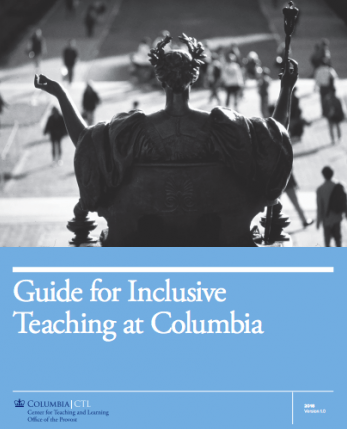 The Guide for Inclusive Teaching at Columbia helps instructors answer that question by offering five inclusive teaching principles derived from research and evidence-based practices. In addition, the guide contains practical, accessible, and usable strategies that instructors can use immediately. We invite you to contact the CTL with questions, suggestions, or ideas for collaborating with us on this initiative at CTLInclusiveTeaching@columbia.edu. Learn more about the approach to the guide and the creation of the five principles. Design all course elements for accessibility. Establish and support a class climate that fosters belonging for all students. Select course content that recognizes diversity and acknowledges barriers to inclusion. Reflect on one’s beliefs about teaching to maximize self-awareness and commitment to inclusion.